something else but I forget what! 21 empty bottles of vinegar and tide. It was hard to put a picture of that up on my blog, but I did perhaps it will inspire someone to clean that pile they have been avoiding. Today, I was sad getting rid of my kids’ Dora games from 6 years ago. But it was time to let it go. Thanks for this challenge! I know we will all be happier by the end of the month. Too much to count! I’m gearing up for a moving sale. I’ve also recently decided that my time with direct sales business has come to an end. So I’m going through all my supplies to pass on to fellow consultants to help them. I was able to empty a large storage cabinet. I was also able to pack 2 boxes of product that I’m keeping to give as gifts. It’s been a productive morning. I’m also trying to do more than 7 so I will be ready for my sale on the 18th. 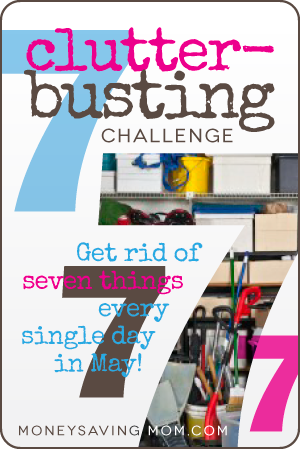 It’s a great time for this challenge! I am estimating that we cleared out 100 plus items over the weekend and I am counting that for all this week since we are getting a house full of company tomorrow for our youngest daughter’s college graduation. Most all of that was in the garage and when I go out there I just feel so good about seeing the floor where there was a pile of stuff before! Be back with you next week after the guest rooms are empty! Woohoo! Great job! Enjoy your celebrations with company this week! So excited to be joining the ‘fun’ here. Okay, maybe not fun, but it does feel good to get rid of excess stuff. I cleaned the garage over the weekend so was able to make a big dent in the overall goal for the month. I also came face to face with a mouse, then found where she had made a comfy nest using one of my car wash towels, so that gave me extra incentive to clean up and clear out to leave less hiding places for little critters to live. LOL! I took 6 books to the library – 2 returns and 4 donations; got rid of my To Do work journal from 2004 (?!? ); and tossed a bunch of Munchkin craft projects that have been collecting dust in the closet (but that’s our little secret). This weekend the kids and I went through their toy boxes and part of their closet and got rid of 143 items….crazy! They were excited too! I also got rid of an additional 20 items from around the house on Saturday. I worked on sorting through a pile of stuff that had been sitting outside of our back door. I am so glad to have that ugly pile all cleaned up. a sample bottle of Listerine with an expiration in 2007! I’ll donate what I can, recycle what I can, and toss the rest! This is kinda fun! Good idea…linen closet! That will be tomorrow. Thanks!! I got rid of WEEDS in my yard! I am loving this challenge! 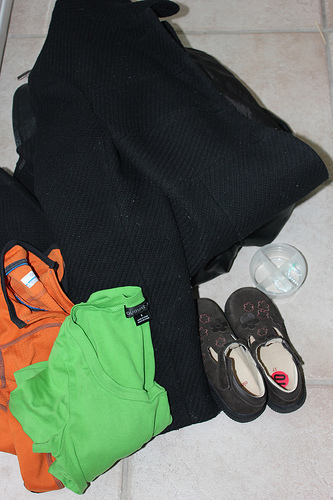 Crystal, what are you doing with your items…donating or saving for your annual garage sale? We’re donating them this time around because I’m not sure when and if we’ll be having a garage sale and I don’t want them cluttering up my garage for very long! Donation Truck is coming tomorrow morning so all of my donations, except the ones I am taking to church, for the last 6 days will be out of the house! The recycle truck came today, too. It was a little harder for me today. I wasn’t sure where to look to find things to purge but thankfully I found items slowly throughout my normal routine. I definitely got rid of items I have been holding on to. I would not have tossed these items without the motivation from the challenge. 🙂 Thank you! That’s one of the great things about this challenge! I have found several things as I go about my day that are definitely clutter, and now I am in a “clutter-busting” mindset, so I gather them and they are gone! I was just looking through all the posts from the 30 day cleaning challenge and I’m wondering where I can purchase the Norwex cleaning cloths?? Thanks! Check to see if there’s a local distributor in your area or look online — I think you can order them through their website. Wow, they are pricey. Do you feel they are worth the extra expense? Had a garage sale this weekend with a friend and got rid of 100s of my twin boys’ picture and early reader books. Seriously, even after getting rid of that many, their shelf is still full. Mainly advanced reading material and some old favorites. Some guy came and bought my whole lot of books for a very fair price. Also, got rid of my boys’ outgrown large Little Tikes trucks and Melissa & Doug puzzles (yes, they are almost 11 and I still had them). I was very sad though to sell their play tunnel, especially because I practically gave it away. Some quick talking older gentleman convinced me to sell it to him for $1 when I already had it marked at a rock bottom price for it being in excellent shape. Still kicking myself on that one. 12 jars of spices here! I had no idea I was hoarding so many things we would never use! Only four items, but progress! Today I got rid of two almost dead Easter Lily’s, 8 magazines and a hot plate/warmer. Cleaned out/organized the linen closet that holds kids bedding, diapers, etc. Since I’ve got 2 who are potty training and an infant who will be in diapers for at least 18 months, I packed up the big kids’ extra diapers to save for baby and got rid of the training pants we no longer use. I also got some crib bedding ready for consignment, and organized shelves according to each child. It feels so great to be getting rid of the extra, organizing the essentials, and getting things ready for our move in a couple of weeks! !